The 7DAYS EuroCup Coach of the Year for the 2016-17 season is Pedro Martinez of Valencia Basket. Martinez has guided his team to a EuroCup-best 17-3 record and a place in the EuroCup Finals for the fifth time in club history with a chance to add to its record three crowns. 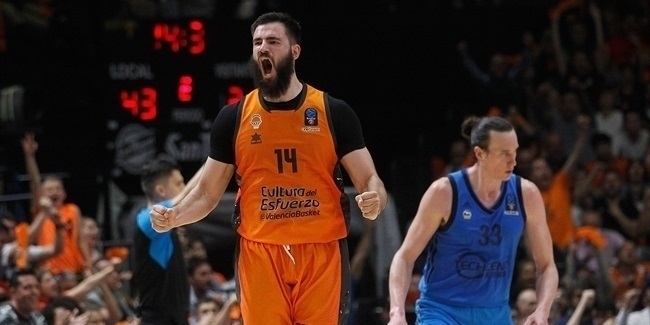 Valencia stormed through the regular season with only one loss in eight games, and followed that with an undefeated run in a strong Top 16 group against the likes of ALBA Berlin, Cedevita Zagreb and future opponent in the finals, Unicaja Malaga. That performance earned Valencia home-court advantage throughout the playoffs, and Coach Martinez and his team have used it to the fullest. In both the quarterfinals and the semifinals series, Valencia ousted Khimki Moscow Region and then Hapoel Bank Yahav Jerusalem by going 4-0 at home, including resounding Game 3 victories to advance to the finals. As he is attempting to re-write the EuroCup record books, Coach Martinez has also become Euroleague Basketball’s choice as the 2016-17 EuroCup Coach of the Year. 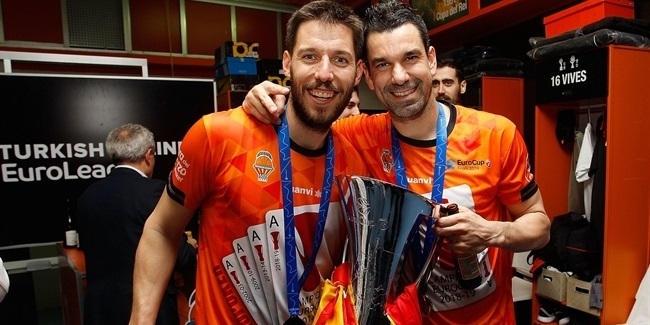 The EuroCup Coach of the Year is part of an awards structure designed to recognize the finest EuroCup participants for their efforts throughout the season. Rolands Smits of Montakit Fuenlabrada was already named the 7DAYS EuroCup Rising Star Trophy winner for this season. Euroleague Basketball's in-house experts will also select the All-EuroCup First and Second Teams and the EuroCup MVP. Martinez becomes the ninth winner of the annual Coach of the Year award, which was introduced prior to the 2008-09 season. The previous winners were Oktay Mahmuti of Benetton Basket in 2009, Ilias Zouros of Panellinios in 2010, Aleksandar Petrovic of Cedevita Zagreb in 2011, Jure Zdovc of Spartak St. Petersburg in 2012, Fotis Katsikaris of Uxue Bilbao Basket in 2013, Andrea Trinchieri of Unics Kazan in 2014, Aito Garcia Reneses of Herbalife Gran Canaria Las Palmas in 2015 and Maurizio Buscaglia of Dolomiti Energia Trento last season. Valencia and Martinez built success on a defense that allowed the second-fewest points in the competition (73.85), but also on an attack without go-to scorers, one that epitomizes offensive versatility and balance. Valencia had 12 players this season who appeared in at least 12 games and all but one of them averaged at least 5.3 points per game. Seven different Valencia players average at least 8 points per contest, led by veterans Bojan Dubljevic and Fernando San Emeterio. 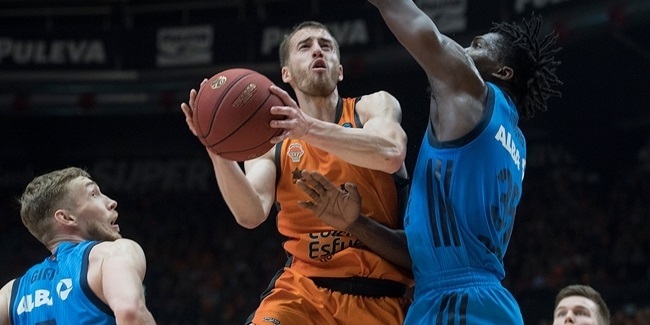 Valencia has excelled in taking care of the ball by committing a league-low 11.6 turnovers and has been the best in offensive rebounding (12.5) this season, in the process setting a single-game EuroCup record with 27 offensive boards in Game 1 of the quarterfinals against Khimki. Valencia is also the runaway leader in assist-to-turnover ratio (1.66-to-1), ranks third in rebounding (37.5 rpg) and free throw shooting (78.7%), and fourth in assists (19.2). Valencia has only lost three games to two different teams this season. Hapoel Bank Yahav Jerusalem is the only team that defeated Valencia before the playoffs in Round 2 of the regular season. In between that first defeat and its second loss, on the road in Game 2 of the quarterfinal series against Khimki, Martinez's squad strung together 13 consecutive wins, which was the longest such streak for any team this season. Martinez already has a place in the basketball history books as the youngest coach to win a European club competition. Now 55, Martinez was only 28 years old when he guided Joventut Badalona to the 1990 Korac Cup with a finals sweep of Scavolini Pesaro. This year marks the second time he has reached the EuroCup Finals after he led Akasvayu Girona to the then-called ULEB Cup title game in 2008. Girona lost against Joventut that season. Joventut is the team where Martinez started his coaching career, first with the junior team and as an assistant in the late 1980s, before taking over as the head coach late in the 1989-90 season. His first full-time coaching gig was with Manresa from 1990 until 1994, and he also coached fellow Spanish sides Salamanca, Ourense, Granada, Menorca, Tenerife, Gran Canaria, Tau Ceramica, Estudiantes and Sevilla, and has appeared in more than 750 games as a head of bench in the Spanish League, which is second all-time in that competition. He has made his way up the charts in the EuroCup, too, where this is his ninth season coaching. Now, in addition to a pair of finals appearances nine years apart, and a EuroCup quarterfinals appearance with Gran Canaria in 2010, Martinez is the 7DAYS EuroCup Coach of the Year.